Closing the Knowledge Transfer Cycle: ATLAS – Better Body Bags – ATLAS? One of our dreams from a year ago, was to show that THE Port can create Knowledge Transfer Cycles and now we have a promising first candidate. During last years hackathon metallized BoPET foils, as used for example for the recent ATLAS Inner Detector upgrade, were discussed for use in the Better Body Bags. Reviewing the material specification of similar multi-layer foils designed for the food industry during the hackathon identified better alternatives. Now the question as to whether their advantages can be used for detector construction is under investigation for the ATLAS ITK Upgrade foreseen for 2023. You can find more encouraging news about the Better Body Bags in the Short News. Don’t waste more time! 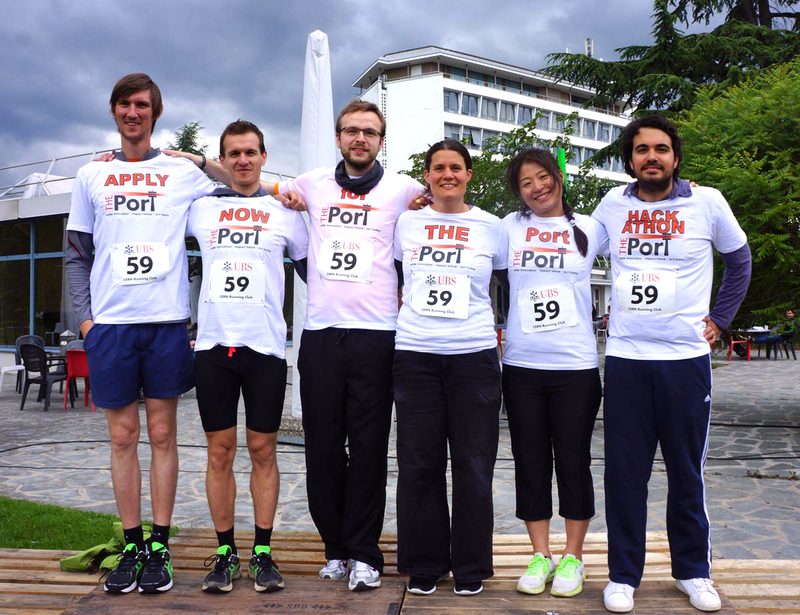 Applications to the second edition of THE Port Hackathon will be open until 1 June 2015. Go to THE Port website and send us your application. We’ll love to read from you! Still not an Ambassador? Join the community! On May 14, THE Port turned one! Here’s a lovely throwback picture from THE Port constitutive meeting in 2014. THE Port is running for you! Today Tomoko (500m), Estel (500m), Leonardo (800m uphill! ), Karolos (300m), Oliver (800 uphill!) and Clement (1000m) teamed up for this years CERNs annual relay race as THE Port mixed team to promote our next hackathon event. Well done and a huge thank you for your full body commitment. Photos. James Devine from the Cosmic Ray Team gave a talk at TEDxGeneva Make It Work! on April 16, 2015. THE Port and Impact Hub Geneva hosted an informal workshop on the theme “Hackathons for International Organisations – Solutions to Challenges” on May 5. The event was attended by over 40 professionals and experts from twenty different organisations active in the humanitarian field. To present their findings, the team Body Bags with their newly founded “Social Solution Research Association” has been invited to give a presentation at the 6th Forensic Advisory Board meeting of the ICRC on 28th May. Furthermore the team will be giving a pitch about their project at the next CERNs Knowledge Transfer Entrepreneurship meeting taking place on 27th May. “InnoGEX is a CERN incubator which stimulates creation and development of innovative companies, which are in connection with CERN, on the territory of Pays de Gex.” For two teams of 2014 we already started discussions if this might be an opportunity and we will look now in the application process. If this sounds interesting to you – just let us know. Thank you, Frauke and Joshua! Our two interns from Internatsschule Schloss Hansenberg have ended their internship at THE Port. The presentation timer using cosmic rays that they developed will be featured in the Hackathon 2015 to show how much time the teams have left during their final presentations to the public. Once again, thank you guys! Do you want to keep us updated on your topic? Send your story and share the progress with THE Port community!